With a stay at Ashfield Hotel in Huddersfield, you'll be within a 10-minute drive of John Smith's Stadium and Greenhead Park. This hotel is 11.4 mi (18.4 km) from Yorkshire Sculpture Park and 0.8 mi (1.2 km) from Magic Rock Brewing Co. Ltd.
Stay in one of 51 guestrooms featuring flat-screen televisions. Complimentary wireless Internet access is available to keep you connected. Bathrooms have shower/tub combinations and hair dryers. Conveniences include desks and coffee/tea makers, and housekeeping is provided daily. With a stay at The Huddersfield Hotel in Huddersfield, you'll be within a 10-minute drive of John Smith's Stadium and Magic Rock Brewing Co. Ltd. 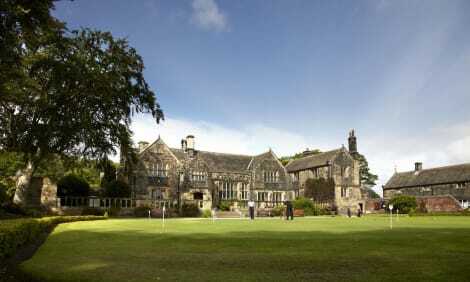 This hotel is 10.5 mi (16.9 km) from Yorkshire Sculpture Park and 13.6 mi (21.9 km) from Peak District National Park. With a stay at The Cambridge Hotel, you'll be centrally located in Huddersfield, within a 10-minute drive of John Smith's Stadium and Magic Rock Brewing Co. Ltd. This hotel is 11 mi (17.7 km) from Yorkshire Sculpture Park and 18.5 mi (29.8 km) from Elland Road Stadium. At The Three Acres Inn & Restaurant, enjoy a satisfying meal at the restaurant. Quench your thirst with your favorite drink at the bar/lounge. A complimentary full breakfast is included. With a stay at Huddersfield Central Lodge in Huddersfield, you'll be within a 10-minute drive of John Smith's Stadium and Magic Rock Brewing Co. Ltd. This hotel is 10.6 mi (17.1 km) from Yorkshire Sculpture Park and 13.7 mi (22 km) from Peak District National Park. Treat yourself to a stay in one of the 2 guestrooms, featuring private spa tubs. Kitchenettes are outfitted with full-sized refrigerators/freezers, stovetops, and microwaves. Complimentary wireless Internet access keeps you connected, and DVD players are provided for your entertainment. Conveniences include phones, as well as desks and coffee/tea makers. Huddersfield is a large market town in West Yorkshire, a county in northern England. The town has a strong tradition of distinguished Victorian architecture, exciting sports and thriving culture. Coupled with the fact that it is set on the edge of the stunning Peak District National Park and South Pennines, this makes a visit to Huddersfield extremely rewarding. Nothing beats a walk around Huddersfield as a way of fully immersing yourself in British history. If you arrive by train you will be struck immediately by the majesty of Huddersfield Station, which was described by the poet John Betjeman as the ‘most splendid station facade in England'. After you have admired the town at street level, take a trip up Castle Hill and Victoria Tower to get an all-encompassing view of Huddersfield. This hill has been occupied since the Stone Age and dominates the town's skyline. The tower was built in 1898 to commemorate the 60th anniversary of Queen Victoria's coronation. From its top, you can enjoy panoramic views of Huddersfield and the gorgeous surrounding countryside. For a dose of social history, head out to the Colne Valley Museum, on the outskirts of town. The museum is made up of former hand-weaver's cottages that offer a fascinating insight into the lives of those in 18th-century Huddersfield. The whole family will be amazed by the Loom chamber, spinning room and gas-lit cobbler's shop. If you're into more contemporary exhibitions, then head to Huddersfield Art Gallery. The incredible permanent collection here includes works by some of Britain's greatest artists, including LS Lowry, Henry Moore and Francis Bacon. There is also an ever-changing and exciting programme of special exhibitions at the gallery. Grab a souvenir of your trip from one of Huddersfield's great shops or markets. The Byram Arcade is a charming arcade and consists of three floors of small vendors selling everything from clothing to furniture. For a more raucous atmosphere, head to Brook Street Outdoor Market. The fabulous cast iron building hosts a general market on Mondays and Thursdays, plus a bric-a-brac market on Tuesdays and Saturdays. With so much on offer from the huge array of stalls, you'll be sure to grab yourself a bargain. After a day of vigorous sightseeing you'll no doubt be hungry. Luckily, Huddersfield is home to an excellent array of restaurants serving cuisine from all around the world. You don't need an excuse to visit Parky's Bistro, where you will get stellar service and sumptuous food in an unfussy environment. For something a little less formal try Tamanna's, probably the pick of the bunch of Huddersfield's many Indian restaurants. After your meal, head to the Yorkshire Rose on Leeds Road, for a refreshing pint in a cosy family-friendly pub. Your Huddersfield hotel is also the perfect base from which to explore the vast natural beauty of the Peak District National Park which borders the town. Whether or not you are a keen rambler, there is something for everyone in this stunning landscape.